The Carson City Post Office is an imposing late 19th-century building encompassing an entire block in the heart of Carson City. It was the second Federal building erected in Nevada (the first was the U.S. Mint), although it housed the third location of the Carson City Post Office. The cornerstone for this building was laid in September 1888, and the building was complete and occupied by May 1891. 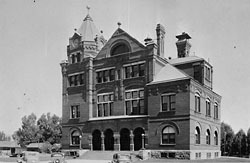 The comprehensive use of brick in construction by architect M. E. Bell, the textural qualities, the immense squareness of the building and the clock tower, in addition to rectangular and arched fenestrations, are all typical of the Richardsonian Romanesque style. This style combines Romanesque Revival with Chateau-style massing and silhouette. This building is the only example of this architectural style within the state of Nevada. 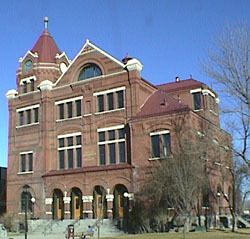 Originally, this building functioned as the Carson City Post Office, Land Office, Weather Bureau and U.S. District Court. It included Carson City's first and only clock tower, which rises approximately 106 feet above street level. In 1908, the restrooms were upgraded; in 1935, an elevator was installed, the first in Carson City. Then in 1955, a brick loading dock was added to the rear, the lobby was enlarged and the chimney was removed. In 1971, the building ceased to function as the Post Office, which moved to a new building two blocks to the northeast. In 1972, an extensive interior renovation was completed to accommodate the State Library. Very few modifications have been made on the exterior, so the building's appearance is much the same today as it was over 100 years ago. The wood window and door frames, cast iron columns, safes manufactured by National Safe and Lock Company and the clock tower are all original. Today, the Nevada Commission on Tourism is the main occupant of the building. The Carson City Post Office is located at 401 N. Carson St., at the corner of Carson and Telegraph sts. in Carson City. The building is open to the public 8:00am to 5:00 pm, Monday-Friday. The clock tower has recently been restored to working order, chiming on the hour.